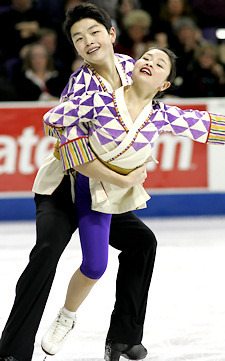 Maia Shibutani and Alex Shibutani perform to Japanese Kodo Drums music at the 2010 AT&T U.S. National Figure Skating Championships. World Junior silver medalists Maia Shibutani and Alex Shibutani increased their lead over the rest of the junior dance field after a fantastic original dance to Japanese Kodo Drums music. The dance was highlighted by a daring rotational lift at the end of the program in which Maia is upside down and perpendicular to the ice that stamped an explanation on the program. The siblings were pleased with the quality of their performance, but were disappointed with the levels that they received for three of the four elements in the program. The Shibutanis earned a total of 56.17 points for their efforts in the original dance, and have amassed a total of 91.89 points heading into the free dance. Rachel Tibbetts and Collin Brubaker finished in third place in the original dance, but remained in second place overall on the strength of their compulsory dance score. Their sweeping interpretation of Eva Cassidy’s Tennessee Waltz earned the duo 49.24 points, and they have 83.00 points heading into the free dance. “We skated well, and performed our best,” Tibbetts said somberly. “Anytime you stay on your feet and stay healthy in a competition, it’s good,” Brubaker added. Like the leaders, Tibbetts and Brubaker struggled with earning high levels on their elements, but were fine with their performance and placement nevertheless. Last year’s bronze medalists Piper Gilles and Zachary Donohue moved up to third place after a new original dance to the music of John Denver. The Michigan-trained duo earned 51.04 points for their Western folk dance, and are less than two behind points Tibbetts and Brubaker with 81.85 points. Gilles is motivated to finish strong in this competition to increase her team’s chances of competing at the World Junior Championships. “I’ve been an alternate for the last three seasons,” said the motivated Gilles. “I have extra incentive to earn a trip to The Hague as I have family there that I have never met. It would be nice to be able to meet them and compete in the Junior Worlds. Isabella Cannuscio and Ian Lorello slipped one spot after the original dance and are now in fourth place overall. Their Russian folk original dance was the fourth best of the night, and the duo has a cumulative total of 78.59 points. Anastasia Olson and Jordan Cowan moved up to fifth place after an eighth place finish in the compulsory dance, and lead sixth place finishers Lauri Boncorsi and Travis Mager by .06 points heading into the free dance. The junior dance medalists will be decided on Thursday afternoon.